Two young boys at work in a textile mill. Before child labor laws went into effect, many companies employed young people at low wages, often exposing them to overwork, as well as hazardous and unsanitary conditions. Federal and state legislation that protects children by restricting the type and hours of work they perform. The specific purpose of child labor laws is to safeguard children against harm generally associated with child labor, such as exposure to hazardous, unsanitary, or immoral conditions, and overwork. Child labor legislation primarily applies to business enterprises, but in some states nonprofit activities are within the purview of the law. The federal law controlling child labor is the Fair Labor Standards Act of 1938 (FLSA) 29 U.S.C. §§ 201 et. seq., administratively regulated through 29 C.F.R. Part 570 et seq. The law is enforced by the U.S. Labor Department's Wage & Hour Division. Federal law provides the basic structural framework for certain prohibitions or restrictions placed on the employment of children. Regulations further delineate minimum requirements to include age restrictions, Minimum Wage provisions, occupational restrictions, hours of work restrictions, and certain prohibited fields or occupations (e.g., hazardous occupations, liquor and lottery sales, or occupations involving moving vehicles or power-driven machinery). Moreover, all states and the federal government require that children have work permits on file with their employers that certify their ages. (29 C.F.R. § 570.9) Each state also has its own set of child labor laws that may further prohibit or restrict employment of children. The laws vary in detail from state to state, particularly for those states where seasonal or agricultural employment is high. However, federal law preempts state law, and so all state laws must comply with all federal minimum requirements. Specific provisions of the particular child labor law govern the age of majority. Some laws permit minors to be employed in certain activities if their parents satisfy stated conditions concerning supervision, control, and approval. The state has the right to prohibit parents from binding a minor to an employment contract based upon the theory that parents cannot diminish benefits that the law confers to children. Cursory directions to subordinates are not sufficient to fulfill the employer's duty to enforce child labor regulations. Where such directives are followed by further violations, sterner measures controlling the actions of subordinates are required. In some states, it is unlawful to employ children under a specified age in certain activities without an employment certificate issued and filed in accordance with the law. An employer's failure to comply with this requirement makes the employment illegal. Technical errors, such as the lack of a detailed account of the child's duties in the employer's pledge of employment, will not have this effect nor invalidate the certificate. Regulations also relate to occupations that are or may be potentially dangerous, extremely hazardous, or harmful to a child's health or morals, as defined by statute or judicial decision. In one state a log-loading machine was held to be within the meaning of a law that barred the employment of minors in businesses using dangerous machinery. The violation of child labor regulations can subject the perpetrator to criminal prosecution or render the employment contract illegal. In appropriate circumstances an Injunction,a court order that commands or prohibits a certain act, may be issued against a violator to stop the illegal conduct. 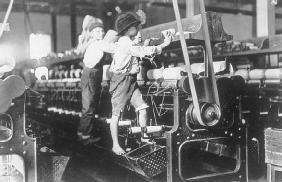 In 1919, Congress passed the so-called child labor tax law, (40 Stat. 1057) which imposed a ten percent excise tax on persons or establishments that employed children under the age of 14 or children between the ages of 14 and 16 working more than eight hours daily or more than six days a week. However, in Bailey v. Drexel Furniture Co., 259 U.S. 20, 42 S. Ct. 449, 66 L. Ed. 2d 817 (1922), the U.S. Supreme Court invalidated the law as unconstitutional, agreeing with a lower court that "the provisions of the socalled taxing act must be naturally and reasonably adapted to the collection of the tax and not solely to the achievement of some other purpose plainly within state power." Liability for child labor law violations depends upon the provisions of the law. As a general rule, the owner of the business is liable, whether it is a natural person, a corporation, or a joint association. An employer is usually not liable if a minor is assigned to work on the premises in violation of law by an Independent Contractor, a person whose work methods are not controlled by the employer. Some states, however, will impose liability on the owner under such circumstances. The employer's knowledge that the child is within the prohibited age is not an element of the offense. The offense is committed if the employer does not know but should have known by the exercise of reasonable diligence that the child was underage. The employer's good faith—his honest belief—is no defense even though the child misrepresented his age. A person who hires a child in violation of law will be liable if the child is injured. The duration of the employment and the status of the child as an employee are irrelevant. The parents will not be held liable merely because they assented to the hiring of their child by another. Only the injured child will recover damages, reparations for injury caused by another, for third persons are not within the class of persons that the laws were enacted to protect. During the 1990s, a new issue of child labor moved into the forefront: imported foreign goods that were produced by foreign "sweatshops" employing child labor—legally repugnant in the United States. As more domestic or multinational corporations opened facilities in foreign countries—where labor costs were cheaper—the problem worsened. The FLSA prohibits sweatshops. The U.S. department of labor considers a work place to be a sweatshop if it violates two or more of the most basic labor laws, for example, child labor, fire safety, minimum wage, or overtime hours. Senator Tom Harkin (D-IA) has been at the forefront of legislative initiatives, including the Child Labor Deterrence Act, still pending as of mid-2003. The act would prohibit the importation of manufactured or mined goods that are produced by foreign children under the age of 15. Meanwhile, President bill clinton signed Executive Order 13,126, "Prohibition of Acquisition of Products Produced by Forced or Indentured Child Labor," on June 12, 1999. Executive Order No. 13,126. 1999. Federal Register 64:115:32383 (June 16). Given, Olivia. 1999. "An Indictment of Sweatshops." Child Labor and Sweatshops. San Diego: Greenhaven. Harkin, Tom. 1999. "The United States Should Ban Imports of Products Made by Children." Child Labor and Sweat-shops. San Diego: Greenhaven. Labor Department. Report on the Youth Labor Force. Bureau of Labor Statistics (BLS) Publication, 2000. Labor Law; Parent and Child. 51) The Wisconsin Child Labor Committee reached a similar conclusion that "the violation of the child labor laws, both in letter and spirit, seems to us to increasingly come rather from the side of the parent and child than from the side of the employer. Yet, the government is doing little to ensure that environmental regulations, and mining and child labor laws are enforced, and to transition these mines toward formal recognition. Addressing the meeting, he said that in the event of violation of child labor laws, not only the kiln would be sealed but the owner of the kiln would also go to jail. At the federal level, efforts to enact child labor laws foundered. BOSTON - The state has issued more than 3,500 citations for violations of child labor laws since 2007, but the number has been dropping off in recent years, leading to concerns that state enforcement efforts have relaxed. Although child labor laws were not enacted for several more years, Mother Jones brought the issue to national attention. "I will tell the truth wherever I please." The rules proposed last September would have altered a statutory exemption to child labor laws that currently allow children younger than 16 to work for a parent. The beloved birthday party venue was rung up in mid-December 2011 by the Department of Labor (DOL) for violating child labor laws. Surely President Newt Gingrich would not get rid of child labor laws. This Note examines the need for improvement in federal child labor laws and why such reform is important to protect children at home and abroad. Child labor laws should be put into practice strictly. Newspaper carriers/vendors and minors performing domestic work or work in private residences are exempt from child labor laws, but other laws, including minimum wage, overtime, working conditions and wage collection laws still apply.